Faculty Advisors: Mark Austin and John Baras. Date: September 2002 -- May 2003. Topics : Overview of elevator design; development process; system framework and boundary. Topics : Goals and scenarios; actors; initial use cases with activity diagrams. Purpose : Create simplified models of behavior and structure. Topics : Models of system behavior; models of system structure. Purpose : Generate subsystem requirements and specifications. Topics : Subsystem requirements; traceability. Purpose : Establish measures of effectiveness for the elevator design. Topics : Reliability; cost; performance; safety. Purpose : Create framework for trade-off analysis for selection of components in a small subsystem. Topics : System performance and economics; decision variables; CPLEX problem formulation; trade-off scenarios and analysis results. Purpose : Develop procedures of system test, verification and validation. Topics : Test plan ..... etc. Elevators are prevalent throughout many multi-level structures. They control the flow of foot traffic between various floors of buildings, they allow disabled persons to access upper-level floors, and they facilitate the movement of large items (such as furniture and office equipment) between various levels of the building. Hydraulic and roped elevators are the two main types of elevators in use today. Factors that govern elevator type and design include cost, speed, capacity requirements, safety, and reliability. There are risks involved in the use of elevators. Many factors must be taken into account in order to ensure that persons are not stuck in elevators for long periods of time, or worse that the elevator does not loose stability and plummet to the basement from a high floor. In the event of fire, elevators are not to be used. The engineers designing the system, as well as the construction company assigned to build the building and installing the elevator system are responsible for the safety and smooth operation of the elevator system. The building architects are responsible for providing space and structural support for the elevator. The engineers designing the elevator must ensure that the elevators will perform as specified in a safe manner (meeting all safety requirements and compliance standards). The engineers are also responsible for designing elevators that can be manufactured easily and feasibly and for designing "fool-proof" systems that will work reliably and safely in the event that they are misused. The elevator users are responsible for operating the elevator according to the safety specifications laid out. The maximum capacity is not to be exceeded by users. The building owners are responsible for maintenance of the elevator and for assuring the elevator is compliant before use (via a certificate). The latter certificate is to be available to users so that they can be assured that the elevator is safe to use. The engineers are to communicate to the owners the specifications of the elevators and are to communicate to the builders the space and support that is needed for the elevator to function in its intended way. The architects and builders are to communicate with the elevator engineers to ensure that the structure and elevator are compatible. In the design, installation, and use of an elevator system much communication goes on between the design engineers, Construction Company, building architects, building owner, and users. The first means of communication is the rules and regulations created by government with the help of various other public organizations. Building codes, fire regulations, the American Disabilities Act (ADA) are a few examples of these rules to which the engineers and architects must submit. As far as the specific rules governing the design of elevators, EN81 and ASME/ANSI A17.1 give detailed documentation of what criteria must be met. These documents are the primary means by which the regulating bodies communicate the regulations to the engineers and architects. The engineers that design the elevator must then communicate to the architects to ensure them that these standards are met. They also convey the features and functions of the elevator system and help them choose the elevator that best fits their needs. The engineers also must convey to the construction company in charge of building the building certain specifications that are critical to the installation of the elevator in the structure. The architects, if they are in fact involved at this point in the design process, then must communicate with the builders what how the building will be built with the elevator system included in the design. The architects communicate with the owner and vice versa to ensure the building design meets all the needs and expectations of the owner as well as meeting all safety standards. The owner then communicates with the user, via some type of certification posted in a public location, that the elevator is safe to use and ?up to code?. 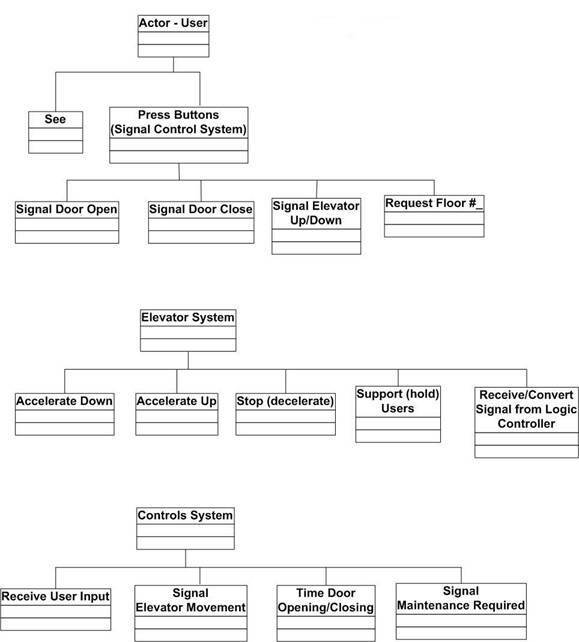 This is a basic overview of the communications that take place in the design, installation, and use of an elevator system. This communication process is in the adjacent figure. An elevator system is an easy concept to understand. In its simplest form there is a single elevator, moving vertically, for serving users on all floor levels. When a user desires to ride the elevator they press a button located in the elevator lobby. The lobby is defined as the area of the building, adjacent to the elevator, on a given floor. The user presses the either of two buttons, up or down, correlating to the direction they want to move. The elevator responds to the pressing of this button via the path of predetermined travel routes or cycles. 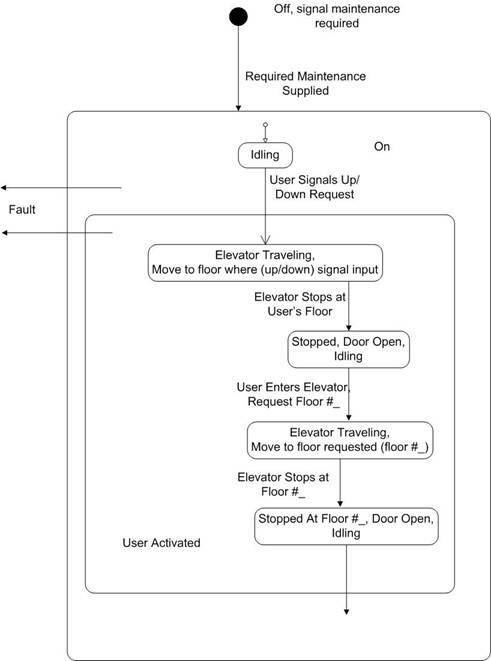 An elevator that is initially idle will dispatch immediately to the floor of the user request. The elevator will stop only for other requests for moving in its current direction of travel. Once all requests have been serviced in one direction of a cycle, the elevator will reverse and begin responding to requests in the same manner as before. An elevator that is idle for several minutes will return to the ground, or bottom, floor. For the sake of simplicity, the elevator system examined in this case study will be for a small business office.� The office is in a 6 story building that houses typical office things like desks, chairs, computers, and employees.� The details of the office will be further explained through requirements and specifications later. Use case development is a prerequisite to the identification of objects/subsystems and object/subsystem operations. A use case describes a single goal and all the things that can happen as the user attempts to reach that goal. Goal 1. The Elevator System must respond to user requests. Scenario 1.1. �When a user presses the Up or Down button, the elevator will begin moving towards them. Scenario 1.2.� When a user presses the button for their desired floor, the elevator will begin moving towards that floor. Scenario 1.3.� When a user presses the Stop button, the elevator will cease all movement. Scenario 1.4.� When a user presses the Door Open or Door Close button, the door will react as conditions permit. Goal 2. The Elevator System must have a good interface. Scenario 2.1. The buttons for the Elevator Request System (Up/Down) must be distinguishable. Scenario 2.2. The buttons for the Elevator Control System (Floors, Door Open/Close, Start/Stop) must be easy to use. Elevator User : This actor is the principle customer. Elevator Logic Controller (ELC) : This is simply the device that controls all of the movements of the elevator. The system boundary is defined by the elevator itself. Our initial use case diagram has two actors and two use cases. Use Case 1 : Request Elevator Use Case. Description : The Elevator User uses the Elevator Request System (ERS) to request an elevator. Preconditions : An Elevator User is at a floor and desires to use the elevator. The ERS sends a signal to the ELC, detailing which floor the user is on. The request is added to a list of floors to visit. The ELC determines which direction to move to service the next request. The doors are closed, if open, and the elevator begins to move towards the requested floor. The elevator stops at requested floors that are along the route to the original destination floor. The ELC opens the elevator door when it comes to a stop. The elevator arrives to service the request of the user. Postconditions : The elevator has arrived in response to a request. Alternative Flow of Events : None. Figure 3. Flow of Events for Use Case 1. Description : The Elevator User uses the Elevator Control System (ECS) to move to a selected floor. Preconditions : An Elevator User is inside the elevator. The ECS sends a signal to the ELC, detailing which floor the user wants to go to. The elevator arrives to service the selection of the user. Postconditions : Elevator arrives at floor selected by the user. We view overall behavior of the "elevator system" as the combination of systems -- the users, the elevator system, and the logic control system. The elements of each system are summarized in Figure 4. Figure 4. Elements of behavior for users of the elevator, the elevator system itself, and the elevator control system. 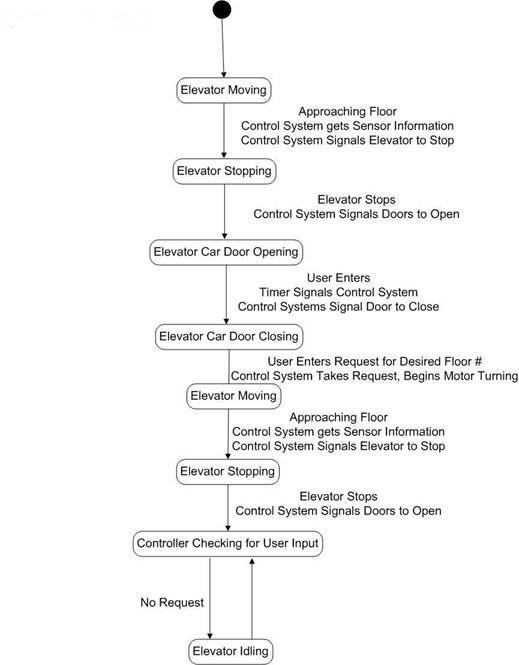 The behaviors of the elevator user, control system, and system hardware (elevator system) are described therein. For further behavioral analysis this study includes a number of operational scenarios, their context, and sequence and ordering of events, prior requirements, and metrics of performance. Scenario 1.2.� When the user, already in the elevator car, presses the button for their desired floor, the elevator will begin moving towards that floor. Scenario 1.3.� When the user presses the Stop button, the elevator will decelerate and stop immediately. Scenario 1.4.� When the user, inside the car, presses the Door Open or Door Close button, the door will react as conditions permit. Every elevator system must be equipped with a control system that will receive the rider input and translate that into a signal that will control the actual elevator hardware. Where people want to go? Where the elevator car is? The first input comes directly from the riders. The user pushes the floor number inside the elevator car signaling their final destination. When the floor buttons are pushed the logic controller receives the signal and registers the user's request. The second input "where each floor is" can often be determined by the addition of holes located on a long vertical tape inside the elevator shaft. The elevator car is equipped with a light or magnetic sensor that reads the number of and which holes are being passed by the elevator car as it ascends and descends. The computer is equipped with a means of varying the speed of electric motor (connected to either of the following system designs) so it can slow down the car when it is approaching a floor at which it is to stop. Logic controllers must have some way to determine in what order riders should be picked up and dropped off. Many elevator systems will move in one direction (e.g., upward) and only pick up riders that are also signaling to go in that direction (e.g., upward). When the final floor that has been requested in that direction (e.g., upward) is reached the elevator will turn around and pick up all riders signaling the opposite direction (e.g., downward). Of course, the elevator car also stops at all floors for which riders, already inside the car, have input a requested. A more sophisticated system, often used in hotels and other large buildings with a lot of foot traffic, involves the traffic patterns that reoccur. These systems have logic controllers that are programmed with information about the demand on each floor with respect to the time of day and they route the elevator cars accordingly so as to minimize the wait for all riders. When there are multiple elevator cars, the logic controller bases the movement on each car on that of the others. Often, the elevator car is equipped with a load sensor so that if the elevator is full to capacity it sends a signal to the control system and the logic controller signals the car not to pick up any more passengers until the load is lowered. The control system's computer also controls the movement of the elevator car doors. The amount of time for which the doors are held open when a floor is reached is programmed into the logic controller. The elevator car doors also have a sensor that detects if someone or something is caught in the door and stops the door closing mechanism from closing the door with the large force that is required. This is also part of the safety system since it ensures that people are not hurt when trying to enter or exit the elevator car. Figure 6. 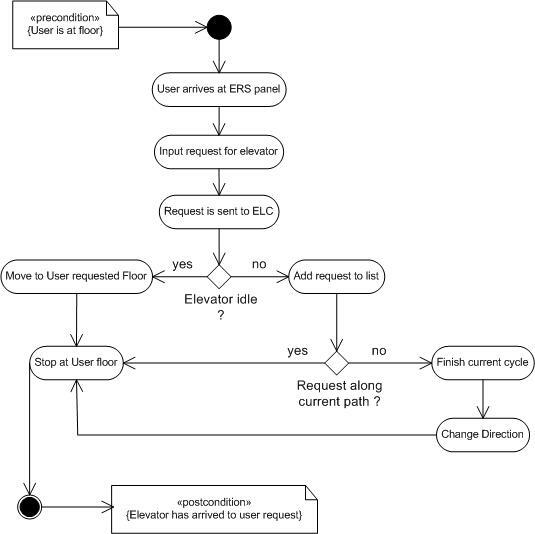 Statechart for Elevator System. The elevator system is comprised of two major subsystems: the control system and the mechanical hardware. After the features and functions of each subsystems have been described, we will generate and analyze design alternatives. Figure 7. 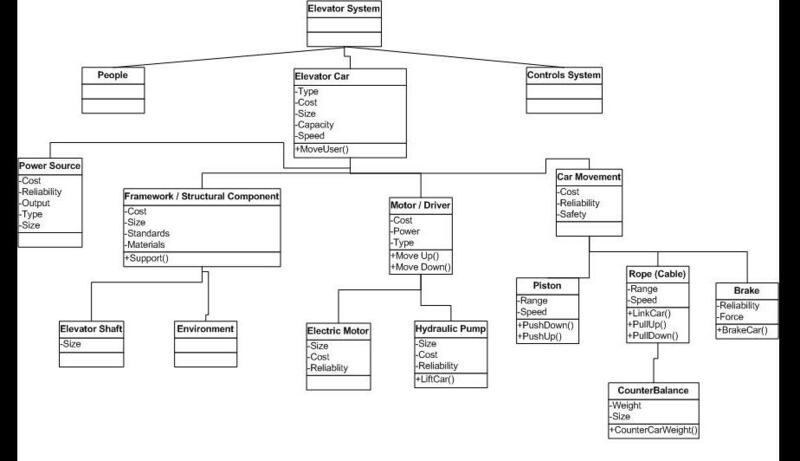 Statechart of Controls Systems Behavior. 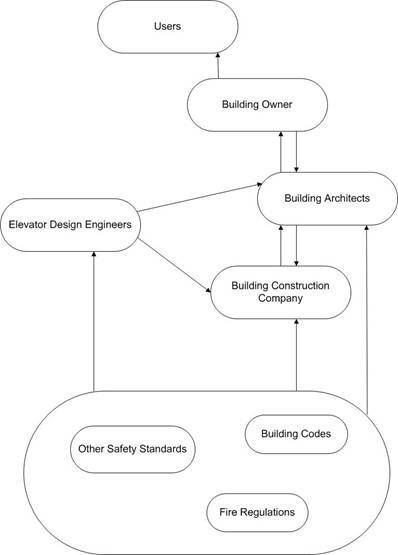 Three of the most prevalent types of elevator system structures will be examined and analyzed in the following sections.� The types will consist of hydraulic elevator systems, as well as geared and gearless �roped� elevator systems.� A brief description of each elevator type follows along with system structure diagrams and design analysis. The basic components of hydraulic elevators are shown in figure 3.1.� The system includes a piston and cylinder arrangement connected to the hydraulic system.� The tank is filled with hydraulic fluid (oil or some other highly viscose fluid) and connected via the valve to the cylinder.� When the control system signals the elevator to move up to an upper-level floor the pump (controlled by an electric motor) pushes the hydraulic fluid into the cylinder.� At this point the valve is closed and the fluid has nowhere to go but into the cylinder.� As it does so, it forces the piston to move upwards, consequently pushing the elevator upwards also.� As the elevator car approaches the signaled floor a signal is sent to the motor to shut off, thus stopping the flow of liquid and the subsequent movement of the piston and elevator.� When it is time for the elevator to move down to a lower level the valve opens and the fluid is allowed to drain (slowly) from the cylinder into the tank.� This relieves the pressure in the cylinder allowing the piston, and consequently the elevator car to accelerate downwards.� When the elevator car approaches the correct floor a signal is sent to the valve (controlled by a solenoid switch) to close the valve.� When the valve is shut the fluid settles and the piston and elevator car rest where they are at the signaled floor. Whereas hydraulic systems rely on pushing the elevator car up and down, roped elevators pull the elevator cab using ropes or cables. One end of the steel ropes are attached to the elevator car while the other end is attached to a counterbalance. This counterbalance weighs approximately the same amount as an elevator car that is 40% full. In between the car and the counterbalance the ropes are looped around a sheave, that is, a pulley with grooved ridges that hold the ropes in place. This sheave is connected to a motor that turns the sheave both clockwise and counterclockwise. When the sheave rotates in one direction the elevator car rises, when it rotates in the opposite direction the elevator car lowers. The adjacent figure shows the basic roped elevator system. Number 5 in the above diagram shows the guide rails. These ensure that the elevator car is stable and does not swing from side to side as it moves up and down the elevator shaft. Within the category of roped elevators there is a distinction between geared and gearless systems. Geared systems involve a gear train between the motor and the sheave that acts to control the gear ratio as needed. Gearless systems do not use a gear train; here the motor is directly coupled to the sheave. Legend for the adjacent figure: (1) Control System; (2) Electric Motor; (3) Sheave; (4) Counterweight; (5) Guide Rails. Both hydraulic and roped elevator systems should be equipped with a complete safety system. Some of the safety systems that most elevators currently on the market utilize are: built in braking systems, a governor, electromagnetic brakes, and a shock absorber system. These subsystems are easier to install in roped elevator systems -- see: http://www.howstuffworks.com/elevators.htm. Another safety feature in most elevators is a sensor on the door that ensures that nothing is caught in the doorway when the doors are closing. When motion or the presence of an object is sensed the doors go to an open position for a specified number of seconds. Then the doors again try to close. These safety systems are included in the system structure diagrams but will not be looked at in any great detail.� Readers are directed to the various references for more information on these and other safety systems. Hydraulic elevators expend a large amount of energy each time the elevator moves upwards.� They are extremely inefficient as well as expensive to operate and install.� The actual cylinder must be buried very deep under the building.� The taller the building, the farther under ground the cylinder must be buried.� The main benefit of using hydraulics is that a more powerful motor can easily be integrated to generate more pump power to lift the elevator.� Even then, this type of design is often infeasible, especially for tall buildings. Roped elevators are considerably more efficient.� Potential energy is stored in the elevator car and counterweight so there is much less energy needed to raise the elevator.� They are versatile and easily supplemented with numerous safety systems.� Much research and development has been done on this elevator type and it is certainly the most prevalent throughout industry. Using the basic system structure as a starting point, we now expand the system structure to lower levels of detail and add attributes and functions relevant to the correct subsystem operation. Figure 9. Elevator Car Subsystem Structure. The "power source" for the elevator is the device providing electric service for all the subcomponent needs. The "framework/structural component" is the physical elevator unit that holds the passengers, typically made from various materials and incorporating one or more doors. The "motor/driver" is the device providing the force to move the elevator unit. Finally, the "car movement" components are how the "motor/driver" is connected to the elevator car. Having generated the baseline textual use cases and the scenarios for the current problem we can now generate the requirements for the Elevator System. Requirements are derived from various goals and scenarios, use cases so it is important to trace back the source of requirement. Per instructor approval, only a part of the entire system structure will be looked at from this point on. Creating a requirements list for every aspects of the entire elevator system structure would be time consuming and in some cases redundant. The aspects of the elevator car type will be investigated from a requirement and specifications perspective, for the sake of learning and demonstrating proper project procedures. Since the focus of this project is now only the elevator car and its components, only these items are developed in further detail. Structure components such as the elevator controls system and/or users will not be developed any further. Requirements for the elevator car system and its subcomponents are given below. MD1 Be at least 99% reliable. MD2 Be capable of operation in ambient temperatures. MD3 Weigh 2000 pounds or less. MD7 Move the elevator in the up direction a distance of 6 stories in less than 50 seconds. MD8 Move the elevator in the down direction a distance of 6 stories in less than 70 seconds. MD9 Support the "dead" weight of the elevator car in the case of failures. FS1 Be at least 99% reliable. FS2 Weigh less than 20,00 lbs. FS3 Cost less than $15,000. FS5 Consume less than 40 amps. FS6 Have required technology/fire safety features. FS7 Have a useful life of at least 20 years. P1 Be at least 99% reliable. P2 Weigh less than 500lbs. P3 Be capable of 10,000 activations. P4 Cost less than $4,000. P5 Capable of handling 360VAC and 100 amps. CM1 Be at least 99% reliable. CM2 Have a range of 6 stories or more. CM3 Stop under max load. CM4 Reverse under max load. CM5 Weigh less than 1,500 lbs. CM6 Be powered by system motor/driver. CM7 Cost less than $25,000. CM8 Incorporate a counterbalance of 40% total weight for roped design. Often these higher-level requirements, which are supplied by the user, are ambiguous and cannot be properly validated. So we take these requirements and break them down to come up with lower level requirements, which are more specific, unambiguous and which could be traceable to system objects / functions in the UML diagrams. This synthesis is a top down approach in the verification and validation. Later with the final system design these requirements are again traced back to higher level requirements supplied by the end user to see if the given system design meets the user specified criteria. CM1-4,6. 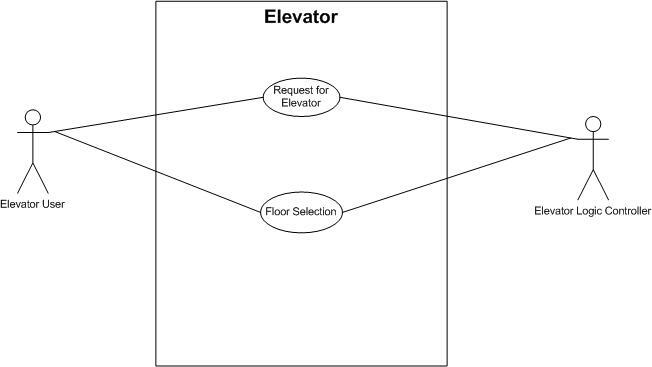 Elevator car must respond to user requests at a given floor.� Elevator moves within the structure along a given path. 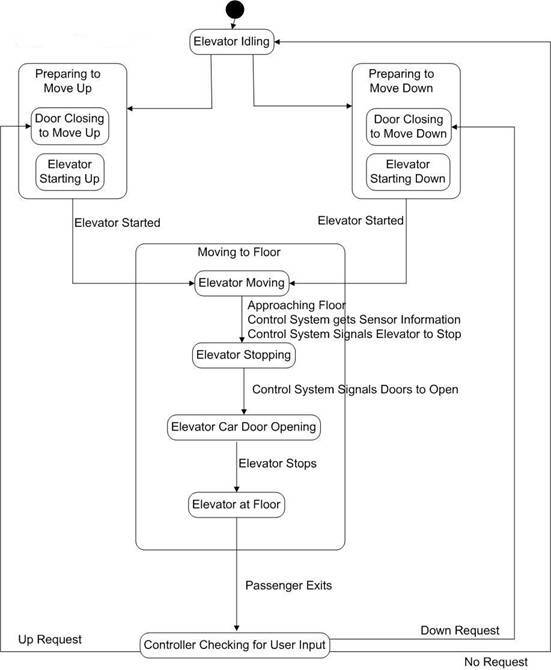 There are many ways of analyzing how well an elevator system works.� To ensure that the elevator will behave as expected for the functions it was intended for an analysis of the elevator �effectiveness� for various systems should be done before the purchase of an elevator system.� After this initial study is done to test the validity and to verify the system behavior should be undertaken.� The latter analysis is outside the scope of this paper so the measures of effectiveness are all that will be looked at in this section.� A small sample of the measures that could be used to describe the elevator system�s effectiveness include reliability, cost, efficiency and safety.� These four measures will be described in more detail in the following paragraphs. Time and use is the test of an elevator system's reliability. The system should continue to operate in the same way it did when it was first installed. The users do not want surprises, all components must continue to function for their intended function and in the intended way. This is important for the building owner and clientele. If the users have a bad experience with the elevator, they will likely get a bad impression of the business or businesses that are located in the building with the faulty elevator. Besides losses of customers, unreliable elevators will need costly and timely maintenance and will lead to major financial burdens. As noted above, cost of elevators includes the purchase price, installation, and maintenance over the system�s lifetime.� To minimize the cost, the elevator should be designed, manufactured, and marketed in a cost effective way.� The reliability of the elevator, the quality of parts and installation, also affect the price of the system over the long run.� If the price tag does not match the product, customers will take their business elsewhere. A major measure of effectiveness is the safety of the elevator system.� Lack of an effective safety system could lead to injury, or possibly death of users or maintenance personnel.� The elevator system must be designed so as to protect riders with multiple backup systems for use in the event of failure of one or more than one critical mechanism.� The elevator should also be easy to maintain with the control room and electric motor in an easily accessible location.� The various safety systems often utilized are described in the above system structure section.� For the sake of this project and simplicity, we will assume the various types and manufacturers under consideration make equally safe elevators. In the elevator industry there are a few decisions that need to be taken before setting up an elevator system. These include the performance characteristics and the decision variables to achieve that performance characteristic. This is largely a multi objective optimization problem with competing objectives with respect to the decision variables. We now develop a multiobjecive trade-off problem for the elevator design that includes the following measures of effectiveness and decision variables. Minimize the Cost of Building the System. This metric relates to the initial cost of installing the elevator system for the office. We assume that system cost is simply the sum of costs for the selected subsystem components. This metric relates the performance of each individual component, with respect to its role for the operation of the elevator. Better performance for each component, will lead to better potential performance of the whole system. This metric relates to the reliability of each component to perform its task. Naturally, the most reliable combination of components is desired. Furthermore, we assume that each decision variable is discrete, corresponding to selection of an alternative from a library of choices. The available options are summarized in the following table. We now cast the multiobjective optimization problem in a format suitable for analysis with CPLEX. The basic goal is to minimize cost, while maximizing performance and reliability. Cost = Cost of Motor/Driver MD (X) + Cost of Structural/Framwork SF(Y) + Cost of Power Source PS (Z) + Cost of Car Movement CM (A). X i = 1 for only one value of i = 1,2,3 and 4. Otherwise, X i = 0. Y i = 1 for only one value of i = 1,2,3 and 4. Otherwise, Y i = 0. Z i = 1 for only one value of i = 1,2,3 and 4. Otherwise, Z i = 0. A i = 1 for only one value of i = 1,2,3 and 4. Otherwise, A i = 0. (0)A1 + (-.848)A2 + (-.239)A3 + (-2.153)A4 <= 0. 0 <= A 4 <=1. X1, X2, X3, X4, Y1, Y2, Y3, Y4, Z1, Z2, Z3, Z4, A1, A2, A3, A4 are integers. We change the value of K1 and K2 to get the different points with various cost, reliability and performance. The following table is the different combination of K1 and K2. Each combination of K 1 and K 2 corresponds to each set of solution variables. The distribution of the points in terms of �cost and reliability�, �cost and performance�, and �reliability and performance� are shown in the following charts, some of the points overlap because some different combinations of K1 and K2 produced the same variable values. Together, these three figures define the cause-and-effect trends in performance for the elevator design. Points of interest are adjacent designs where an incremental increase in one desirable variable creates a much larger increase in another desirable variable. The later represents a point that will be studied later on, to determine optimality. The goal is to find a collection of 4-5 points common to all three graphs and perform the optimality analysis on them alone. Infeasible combinations will also be omitted at this time. Specifically, instances where hydraulic motor/drivers (X1, X2) are not matched with hydraulic car movement components (A1, A2). This affects data points 11-14 only; all other combinations of components are permitted. The optimal solution lies at either point 3, 5, 8, or 10. Comparison of Points 3 and 5. We prefer "point 5" because the increase in cost by 2% (.5/27.5=2%) is offset by improvement of performance of 6% (.15/2.51=6%) and increase in reliability of 20% (3.5/17.46=20%). Comparison of Points 3 and 8. Comparison of Points 5 and 8. We prefer "point 8" because the increase in cost by 9% (2.5/28=9%) is offset by an improved performance of 14% (.37/2.66=14%) and increase in reliability of 31% (4.37/13.96=31%). Comparison of Points 8 and 10. We prefer "point 10" because the increase in cost by 3% (1/30.5=3%) is offset by the improvement of performance 5% (.15/3.03=5%) and increase in reliability of 18% (1.74/9.59=18%). Although the increases performance and reliability for "point 10" are not as dramatic as for "point 8," the former is preferred due to the nature of where performance is increased. Between point 8 and point 10 the expected life of the structure increase 5 years, while all other performance criteria remain equal. Given the importance of longevity, "point 10" is ultimately the preferred choice. According to the analysis, the final choice is "point 10" which has best results for the given constraints. Motor Driver: Component X 3 (electric motor) with force potential of 9,000 pounds. Framework/Structural: Component Y 2 with expected life of 30 years. Power Source: Component Z 1 with load capacity of 140 amperes. Car Movement: Component A 4 (roped design) with range of 6 stories. The system cost and reliability are $31,500 and 0.9821, respectively. To be completed in ENSE 623. Tom Harris, Howstuffworks, Inc., "How Elevators Work." See: http://www.howstuffworks.com/elevator.htm (2002). Copyright © 2003, Mike Buck, Bonnie Lawson, John Baras and Mark Austin. All rights reserved.